Born in France, Anacharsis Fourcade taught drawing and painting before emigrating to the United States in the 1840's. 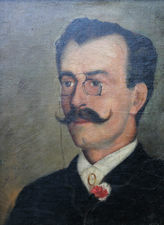 Travelling throughout the South, Fourcade visited numerous cities; ads in period newspapers cite his painting skills and offer painting lessons in the artist's “new and beautiful system of Monochromatic Painting.” Fourcade is known to have lived in Charleston, South Carolina, Wilmington, North Carolina, and Louisville, Kentucky. In 1848 in Montgomery, Alabama, Fourcade married Eliza Ferguson, originally from Georgia. It is unknown if there is a familial relationship between Anacharsis Fourcade and artist Joseph Fourcade, born c. 1775 in France, who worked in New Orleans from 1818-1820 painting portraits and miniatures. This painting exhibits a composition and brushwork typical of mid-19th century France. In addition, the palette displays the monochromatic color scheme Fourcade described in his newspaper advertisements, with the chiaroscuro prevalent in French Romantic works. Ref. : Alabama Marriage Indexes, 1814-1935. The Tri-Weekly Commercial. Wilmington, NC. February 19, 1847, 3. Karel, David. Dictionnaire des artistes de langue française en Amérique du Nord. Quebec: Les Presses de l’Université Laval, 1992.